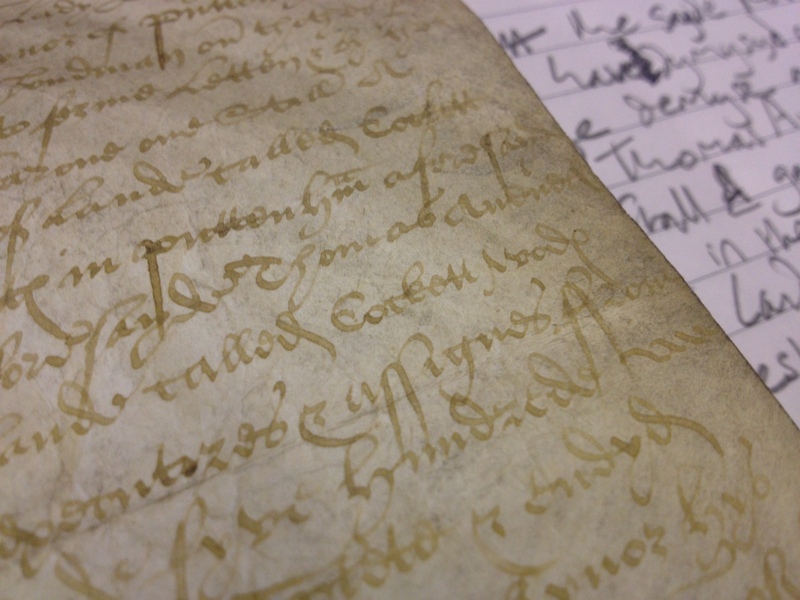 The following is a summary of what I discovered when I spent an afternoon in the Local Studies Library at Godalming Museum examining a later sixteenth-century deed pertaining to land and property in Puttenham parish. The document in question is preserved in the deeds collection of Percy Woods and is calendared as Godalming Museum Local Studies Library PWD/56 (more information on all of the fantastic Woods collections held by the Museum can be found here). As far as I am aware it has never been the subject of any published or publicised piece of research, but its inclusion of early field-name spellings (for Puttenham at least) make it worthy of being brought to wider notice. The date of the deed is not as straightforwardly established as one might think, since it contains a reference to a 14-year lease period of indeterminate start and end-date. The most accurate date for the writing of the deed seems to be the one given at the beginning of its text – 6th January ‘in the thyrd yere of the Rayn of o[ur] Sovrygn Lady Elyzabeth by the grace of god Quene of England’, i.e. 1561. The lease involved a property consisting of a messuage and associated buildings, 48 ‘Acares of lande in the Coma[n]ffelde of puttenh[a]m’ and a further six acres contained in two ‘closes of lande’. The two acreages are of considerable interest because it indicates this leasehold property was predominantly made up of open-field strips, with eight times as much land located in them as in several inclosures. How typical this was of a farm in mid to late-sixteenth century Puttenham is something I’m hoping will be shown by other deeds I’ll now kick on to look at. For now, I would like to focus on the names of the two ‘closes’. According to the summaries available online, these were named ‘Corbett Wodes’ and ‘Breges’. This jarred with me since we have the field-names Cocket Wood(s) (originally *Coccet(t), “woodcock wood”) and Breach (from Middle English breche, “newly-broken land”) in evidence from 1765 onwards and consequently I had a feeling the source transcription was wrong. So it proved; the two names are written twice with the same spellings, ‘Cockett Wode’ and ‘Breches’, confirming they are synonymous with the later recorded forms. The first of the aforementioned fields can be located to the north-east of Little Common, within the area of the Shoelands estate as delimited in the early thirteenth century, which suggests small portions of land had been alienated into different ownership from the rest of the manor at some point after the dissolution of Selborne Priory (Shoelands’ owner from circa 1250) in 1485. Breges/Breach, meanwhile, is to be placed due east of Puttenham Great Common in what is now the Church Croft plantations. This is a valuable (if very belated) indication of the taking in of former common land here during the later medieval period. Hi, interesting blog! I’ve been interested in local history for years… ( I live in the Milford – Elstead area) and have been lucky enough to have discovered what we think is an early Medieval iron bloomery furnace…. I am starting a dig with the Surrey Arch Soc later in August… But we have done a couple of preliminary investigations and found Saxo-Norman period pottery along with iron slag and ore etc…. It could be really interesting bit of local history!